Owned by MAREF Mon Trésor Investments, the development was designed by Architects’ Studio and Boogertman + Partners, with green building consultants Enerxis Solutions and Solid Green handling the certification process. The office park is designed to be a flagship of 21st century conurbation lifestyle, focussing on sustainable values and quality of life where professional, private and social needs are met within an inclusive community that has a genuine local spirit and cosmopolitan flavour. Located within convenient proximity to the SSR International Airport, its cargo logistics, Freeport zones, and the business-oriented Holiday Inn hotel, Mon Trésor Business Gateway specifically serves airport-related business and transits. 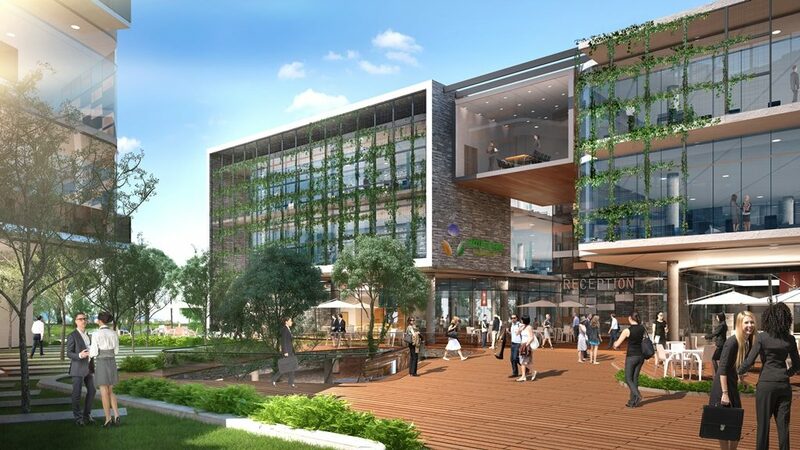 As part of the Mon Trésor Smart City, the office park is developed around a ‘live-work-play’ concept, incorporating environmental and sustainable practices from design through to construction. The building compromises a basement level, a podium level and three office blocks, all complete with roads, infrastructure, external works, hard landscaping, and related facilities. The nearby Airport Mall provides convenient access to facilities such as a pharmacy, gym, bank, cinema, post office, retail outlets, hair salon, convenience store, restaurant and playground. Because consumption information is key to understanding and managing building systems efficiently, and to assessing opportunities for energy savings, the building was fitted with an integrated BMS system to record and log all energy and water usage within the building. This data can be displayed in real time. Sub-meters, linked to the BMS for the monitoring of energy consumption, were installed for substantive energy uses of 100kVA or more and separately for lighting, power and HVAC in each distribution board on each floor. Energy strategies were implemented to reduce overall energy consumption and its associated cost, together with greenhouse gas emissions associated with operational energy consumption. An energy model of the building was generated in the design stage, which showed an improvement over a SANS 10400 notional building. The HVAC system, the most efficient available at present, is a cooled air system making use of minimal water usage. With occupant wellbeing in mind, a high level of thermal comfort was ensured by addressing the internal operative temperatures through modelling. Due to the local climate, no heating was required, and the HVAC system provides temperature control to individual delimited areas. No hot water is provided, further reducing energy consumption. The whole building is equipped with low consumption LED lights with light intensity and motion detector sensors, and fixed shading equipment for luminosity control. The sensors allow the building management team to set the general light level in the office space or to individually set a specific light intensity in a specific zone. Water closets, urinals and tap fixtures were all specified to be water efficient with a low flow flush rate to reduce and control water consumption. This consumption is effectively monitored by water meters for all major water uses and an effective automated mechanism for monitoring water consumption data. This monitoring system will also be able to detect leaks and alert the FM team accordingly, ensuring that little to no water is wasted. Water for irrigation purposes is sourced from an existing sewerage treatment plant (STP) located at the nearby Holiday Inn Hotel. In addition, the development was designed to minimize storm water run-off and the pollution of natural watercourses. In terms of encouraging non-motorised transport, 48 secured bicycle bays and changing facilities with 58 lockers were provided for staff, as well as 16 visitor bicycle bays. Convenient cycling routes were identified between the office development and the adjacent street network, marked with specific signage. 20 parking bays were reserved for fuel-efficient transport, and 20 for 2-wheeled vehicles. Finally, a waste recycling storage area was provided to encourage recycling of resources used within the building to reduce waste going to landfill – for paper and cardboard; plastic, glass and cans; metals; and general waste. It is a great privilege to be part of a project that is a first in its country, demonstrating leadership in sustainability. 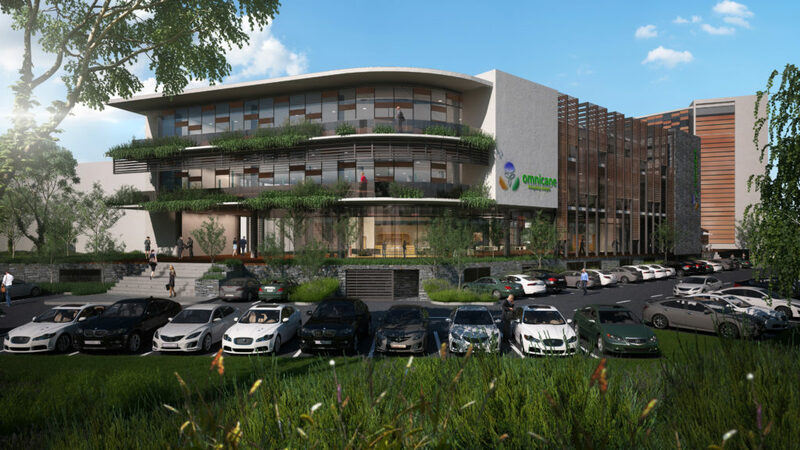 Through their effective relationship, Solid Green Consulting and local partner Enerxis Solutions where able to ensure that the project achieved it’s targeted 4-Star Green Star SA Office v1.1 Design rating. We look forward to commencing with the As Built certification. For more information about this project, see the project page for Mon Trésor Business Gateway. Next News Item →Solid Green scores its Half Century on Green Building Certifications!